No handicap will stop these guys. With the overseas success of 1978’s The Five Deadly Venoms, the world was introduced to the “Venom Mob,” a group of martial artists who would go on to work together in future Shaw Brothers films, usually under the direction of legendary filmmaker Chang Cheh. Composed of actors Philip Kwok (a.k.a. Kuo Chui), Lu Feng, Lo Meng, Chiang Sheng and Sun Chien, the retroactively named “Venom Mob” proved themselves in film after film as talented martial artists, gifted acrobats and topnotch action choreographers. In 1978, they would star in one of their most famous collaborations, Chang Cheh’s Crippled Avengers, which is also known by its alternative Western title, Return of the Five Deadly Venoms. The film kicks off with a group of swordsmen ransacking the home of famed hero Dao Tian-Du (Chen Kuan-Tai). After slicing up some of the hired help, the evil swordsmen lop off the legs of Dao’s wife, before proceeding to chop off the arms of the man’s only son, Dao Chang. While too late to save his spouse, Tian-Du arrives home in time to kill the evil swordsmen and save his son’s life. As the boy grows to manhood, Dao Chang (now played by Lu Feng) is given expert training in the martial arts by his powerful father, plus he’s outfitted with some snazzy mechanical arms to replace his lost limbs. However, if you think that Dao Chang’s tragic maiming will give birth to a new kind of hero mentored to help others you’d be dead wrong. Bitter and overly sensitive about his disability, Dao Chang – with the help of his now malicious and tyrannical father – wreaks havoc on the nearby village, terrorizing the locals into a constant state of fear. If any person sticks his foot in his mouth regarding Dao Chang’s handicap, they’re rewarded with death or dismemberment. The first person to fall victim to the Dao family’s rage is Chen Shuen (Philip Kwok), an affable travelling hawker who gets blinded for simply being in the wrong place at the wrong time. The town’s strongman-turned-blacksmith, Wei Jia-Jie (Lo Meng) is the next poor sap to be wounded when the villainous Dao family robs him of both his voice and his hearing. The carnage continues when a strong-willed stranger named Hu Ah-Kuei (Sun Chien) gets his legs sliced off when he tries to help. 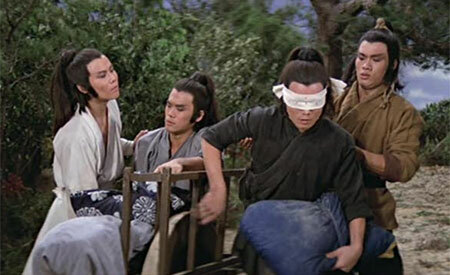 The situation only worsens when the honorable swordsman, Wang Yi (Chiang Sheng), moseys into town and decides to avenge these newly handicapped souls, only to end up with his head in a vice, a brutal torture that reduces him to a mental defective. The group becomes fast friends and bands together, but they are unable to find work, having been blacklisted in town by the Dao family. When they learn that the now-crazed Wang Yi was headed to his master’s temple for martial arts training, they decide to take him back to his teacher. Once Wang Yi’s wizened sifu learns of their plight, he offers to train these four men in the martial arts. Even better, he crafts special techniques and gadgets to compensate for their disabilities. As anybody who has seen a martial arts movie knows, there’s a series of grueling training sequences ahead of them. Three years later, they emerge to spoil Tian-Du’s birthday celebration. But, are they ready to face-off against the able-bodied Dao and son? While totally ridiculous and not at all medically accurate, Crippled Avengers remains a joy to watch all these years later, largely due to its inventive spirit, the camaraderie amongst its stars, and some seriously top-notch martial arts choreography. Philip Kwok and Lo Meng get more screentime than their co-stars, and their easygoing chemistry forms the heart of the film. Still, Chiang Sheng provides ample comic relief as the crazed Wang Yi, while Sun Chien (and his prosthetic iron legs) proves to be a formidable presence on his own. In many respects, Crippled Avengers is a “guy’s movie,” a fact which seems all the more obvious when one realizes that Tian-Du’s murdered wife is the only female character in the entire film.